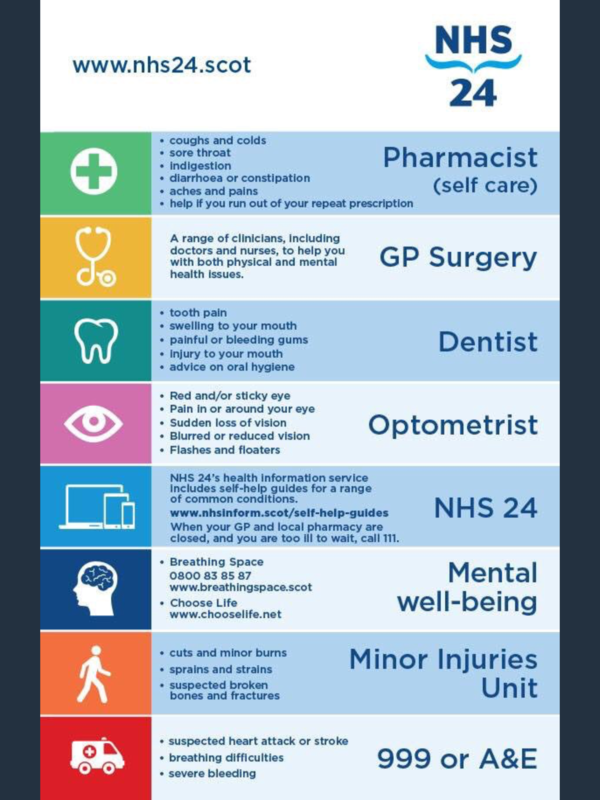 Your GP can help with a range of problems but there’s a whole healthcare team available to you ranging from your local pharmacy for self care advice to opticians for all things eye related, dentists for all things mouth related and of course 999 or A&E for emergency situations. Please remember to make use of the extended care team available in your community! At Moray Coast Medical Practice in Lossiemouth the doctors and nurses take pride in offering the highest standard of patient-centred healthcare. We run many clinics for chronic disease care and offer a wide variety of other medical services such as antenatal and postnatal care, minor surgery, childhood vaccinations and well-person check-ups. We have launched a new Online Services facility (VOS) as of 01.01.14 which enables patients to order repeat prescriptions and manage appointments online. You can download the form for registering for VOS online here.